A few months ago Ellen was telling me about her obsession with macarons and how she was going to try to make them. I wasn't that familiar with these confections although I had seen plenty of beautiful pictures of them on other food blogs. Turns out that 1) they are another species entirely from the coconut macaroons (two o's) that I'm used to, and 2) supposed to be incredibly difficult to make. Naturally, that meant I was going to try at some point. So first of all, macarons are made with almond flour, sugar, and egg whites, whipped to a meringue. They are then sandwiched with the an appropriate filling (ganache, buttercream, jam, curd, etc.) 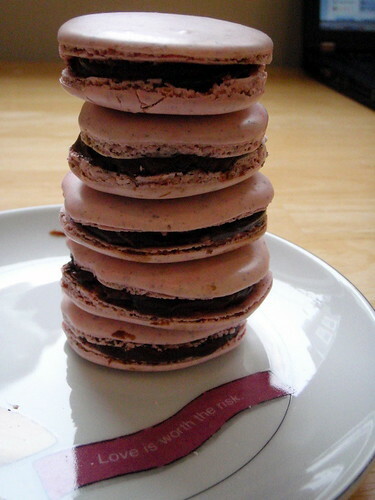 and the resulting sandwich is also (confusingly) called a macaron. An unique feature of the macaron cookie is called the "feet"--the uneven, ruffled skirt around the edge. Amazingly enough, you want feet on your macarons. The hard part about making a macaron mostly involves the meringue and folding in the tant-pour-tant (the one-to-one mixture of almond flour and sugar). One fold too many or too little will result in cracked and/or hollow cookies and no feet. Another difficult part about making macarons is amassing the ingredients and tools needed to make them. Egg whites aren't hard to come by, but one tip that has been circulating around is that they should be "aged" at room temperature at least overnight and up to 72 hours. Sure it sounds disgusting, but any germs and bacteria that might grow would be killed in the oven and the aged egg whites hold a meringue that much better because more water has evaporated, leaving more of the structural proteins. Next, almond flour. If you can't find any you can always make it yourself with almonds and a food processor (although I'm not sure how you would get almond flour vs. almond butter) but luckily enough, Harvest carries almond meal in their bulk bins. Unfortunately, the almonds aren't skinned beforehand, so there's flecks of almond skin in the meal, but what can you do? (Actually, now that I think about it, maybe I can sieve the meal beforehand to try to get rid of the skin....) Anyways, you'll want to use the food processor to grind the meal even finer. One great tip I read is to use the food processor to mix the almond flour and powdered sugar so that you don't have to individually sift the two (which is great because I don't have a sifter, although I guess a sieve would work). To make the macarons you need a mixer (a stand mixer is ideal but I'm too cheap so I just used a hand mixer), pastry bag (again, too cheap to buy so I just filled a large Ziploc bag and cut a hole in the corner), high quality baking sheets (I used my Pampered Chef stoneware cookie sheet), parchment paper, Silpat, or non-stick aluminum foil (I used parchment paper), a food processor (thanks, Carsten! ), a candy thermometer, and ideally, a food scale. You can tell it's an Italian meringue because it is so glossy. There are two ways of making meringue for the macarons, the French way or the Italian way. The Italian way is a little more difficult and involves streaming boiling sugar syrup into the egg whites are they are being whipped but results in almost foolproof macarons as the Italian meringue is much more stable than French meringue. So I chose to try the Italian method. Since I didn't have a food scale (yes, I am cheap!) I used Lesley's recipe here which is "translated" from Tartelette's and decided to try my hand at making a hazelnut macaron with Nutella filling. Yes, you can see the specks of almond skin, but look, you can see feet as well! Begin by placing the water and sugar for the syrup in a small saucepan and bring to a boil. Once the sugar syrup registers 170° F on a candy thermometer, start whipping two of your egg whites. When the egg whites have started to froth, slowly add the 3 T sugar. When the sugar syrup gets to 230° F on a candy thermometer, add it in driblets to your egg whites (which should hold soft peaks at this point). 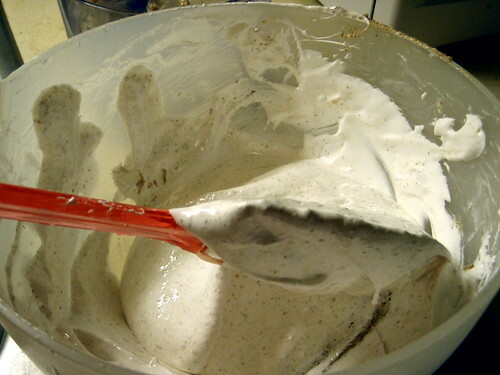 Whip the mixture for 10 - 15 minutes, until cool. Mix the remaining egg whites with the almond meal and powdered sugar in a food processor. Fold this mixture and the hazelnut extract into the meringue mixture. Fill a pastry bag with a 1/4 inch tip (or a large Ziploc bag with a corner snipped off) with your mixture. Pipe 1" circles on cookie sheets lined with parchment paper, non-stick aluminum foild, or Silpat. Bake at 320° F for 12 - 15 minutes. After they are done baking, allow them to cool and carefully transfer them to an airtight container. Macarons can be stored in the fridge or freezer. I made the filling used in the picture above with this recipe, but in the end, I decided I liked just plain Nutella as a filling. I forgot to mention that I had never actually had a macaron before, so I was quite surprised at how sweet it was with my first bite. But after a while I knew what to expect, and it might have helped that I was eating them chilled from the freezer (the colder something is, the less sweet it will taste; one reason why there is so much sugar in an ice cream recipe). So ta-da! I made my first batch and didn't have too many issues: my macarons had feet, weren't hollow, and didn't have any cracks. The hardest part was actually piping the cookies as I had never piped anything before in my life, and I wasn't exactly using the best tool. The macaron batter is actually quite drippy so you really have to be careful if you aren't using a pastry tip. I would definitely recommend having your parchment paper already cut and spread out so that you can pipe all the macarons at one time. One site I read recommending drawing 1" circles onto the paper beforehand so you know when to stop piping and also where to place them. 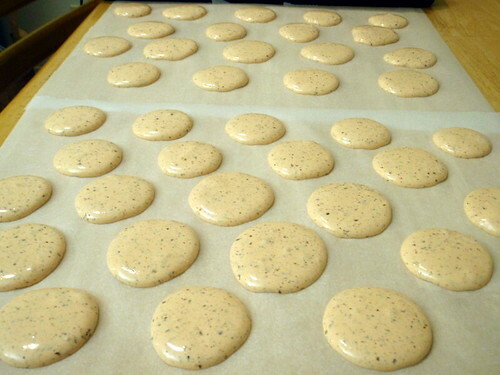 Another tip that I read on many, many sites is to let the macarons sit for an hour before putting them in the oven so that the top can dry out. I didn't really adhere to this with my first batch as I figured that by the time I had piped the last macaron, the first one would have already had a chance to sit a bit. So now that I had one good batch under my belt, I figured it was time to try a different flavor, and I settled on orange macarons with clementine curd using the recipe here. I added orange extract to the macaron batter and used food coloring to try to get them orange. I'm not used to using food coloring, and even though I read that baked macarons come out much lighter than the batter, I was just too scared to get much color into the cookies. And this time I decided to let them sit after being piped. Well I think that was a mistake. Of the four trays I made, only the first one came out without cracks, and I'm pretty sure that was because that one didn't sit as long as the others. Even so, the macarons from the first tray were almost all hollow. =( I was able to salvage a few to take pictures of, but the rest I'm just eating individually and dipping into the curd like chips and dip. I also need to find a filling that's not as runny. As you can see in the picture below, the curd is starting to drip out the sides and one of the principles of macaron making is that the filling should never go past the circumference of the cookie. P.S. I tried the peppermint macarons with peppermint chocolate ganache! Mmm! 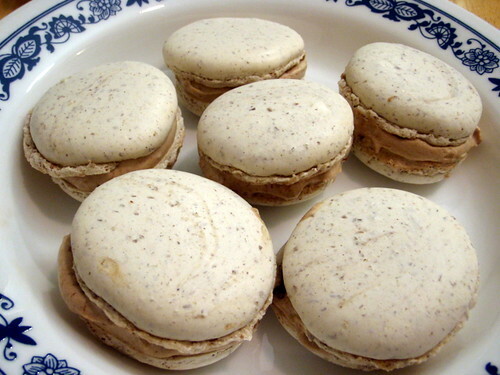 I've just made my first macarons as well =) You can actually blanche the almonds to get the skins off, but you may know this by now - boil water, throw the almonds in for about a minute, then strain it and pour cold water over them. Then the skins slide off or can be scraped off. I've made them in pastry class - lots of fun!! What's neat is that there are all kinds of amazing combinations. My classmate and I went with purple macaroons that had a blackberry jam mixed with French Buttercream center. One group used a green tea/buttercream center that was very interesting and bright green. Raspberry, strawberry, chocolate ganache, orange marmalade... there are SO many options out there!! You can also add a liquer (just a little bit!) that will enhance the flavor. Our blackberry filling had a touch of Violet liquer in it... Thanks for this post, Joy! And happy experimenting with more Gerbet Macaroons!! The title of your post is so accurate. 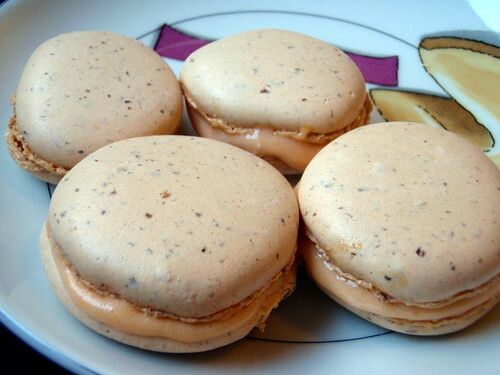 Trying to make macarons will make you a more humble person. After having many beautiful and tasty macarons in Paris, I bought a step-by-step macaron cookbook, translated it from French, and have tried to make these suckers five times. I would only classify one of those batches as a complete success, two batches would probably pass for someone who had never had the real thing...and two were complete failures. I'm not giving up, but this is one of the most persnickity things that I have ever tried to make. Do you just leave the egg whites in an open bowl or do you cling wrap the boil and leave it in room temperature? Did you know that you can shorten your long urls with AdFly and get cash from every click on your short urls.